Florence has plenty of art masterpieces and so many world renowned museums and churches to visit that it is hard to find the time to see something different when you are there. Textiles and fashion are the other strong trademarks of the city whose fortunes are linked to commerce and banking since the Middle Ages. They funded art and fuelled fashion afterwards as well as continuing its artistic commitment by displaying incredible creative talent. The exhibition Tracce: dialoghi ad arte (Traces: dialoguing with art) at the Museum of Costume and Fashion, Palazzo Pitti, aims to set up a dialogue between modern art, artist-stylist and couturiers from 1930s until today. The attention is on not-so-well known Italian artists and on the innovative and creative methods adopted by the fashion designers inevitably influenced by and connected with the art of their time. The link is not always straightforward and could be better explained in some of the captions, but the outfits exhibited are certainly pieces of art in the use of innovative techniques, in the precious textiles and their astonishing beauty. Art has different languages and undoubtedly fashion is one of them. Costumes, accessories, paintings and sculptures interact in the exhibition, reflecting their images in mirrors that allow the viewer to admire the pieces from different angles. The title of the exhibition means to delineate the interaction between different arts, the bridge they trace and the traces they leave in the criss-crossing of ideas and aesthetic concepts. The items are displayed in a chronological order starting from the 50s hinting to exotic culture with the kimono style summer dress by Lanvin, reflecting the search for sophisticated alternatives to the simple models of the time. In the next room the ‘Gorgons’ by Domenico Trentacoste, originally adornments for a chimney breast, gaze ironically on the variety of flowered textiles, such as Gianfranco Ferre’s (Dior couture) dress, an organza evening gown that demystifies the horror of the Gorgons’ myth, their touch beautifies rather than changing into stone. Gianfranco Ferre’s dresses are also connected with Romano Campagnoli’s ‘Animale Marino’ (sea creature), both dresses and painting invent new shapes, modelling their innovative patterns on possible ideas of being human and non-human. This parallel between fine art and fashion is also clear in Mila Schön’s embroideries, looking like engravings, recalling the metal work by Bruno Benelli, ‘Diaphragms’, logic and elegance stress a regained essentiality in the 70s. Other important highlights are Roberto Capucci’s evening gown and Yohji Yamamoto’s jacket and skirt, linked to Alimondo Ciampi’s Ophelia, and Giorgio Armani’s sequined evening gown similar to the shimmering painting of venetian gondolas and fireworks by Guido Marussig. The uniqueness of their design floating in an almost unconscious dream redesigning subjects and perspectives. The exhibition shows and explains convincingly the interaction between fine art and fashion mainly highlighting the quality and preciousness of the high-couture outfits. The paintings and sculptures are sometimes left in the foreground, maybe intentionally, far from the viewer and without enough explanatory captions. Perhaps a clearer link to the fine art works and the costumes would enhance even more this rich and enriching exhibition. Tracce will be on until the end of 2018 but with a rotation of different costumes and paintings from the storage of the Museum of Costume and Fashion and from the Museum of Modern Art of Palazzo Pitti maintaining the same concepts. Gucci Garden Galleria in Piazza della Signoria in Florence is the other unmissable fashion highlight. It is not a museum in the traditional sense, which surprised me at first as I used to consider Gucci an unchangeable high-brow fashion trademark. On the contrary, with the new creative director Alessandro Michele, the museum has been conceived as a Galleria (gallery), a dynamic, shape-shifting space. It merges old and new, tradition and contemporary views, never forgetting where it started from but looking forward to future possibilities as well. Guccio Gucci was born in Florence from humble origins. He worked in London as a porter and lift-boy learning from experience how the structure of a suitcase should be made. Coming back to Florence he set up his workshop which produced travel bags giving job to artisans and workers, aiming at high quality materials, relying on the skill of Florentine craftsmanship and targeting a cosmopolitan jet-set audience. The Galleria exhibition is meant to involve the viewer at different levels starting from the new term ‘Guccification’, a confirmation of the importance of the double G, a charismatic monogram interpreted and reworked in ironic reversed visions, like in Trevor Andrew’s graffiti decorating the room or in Jayde Fish’s spaces inspired by Instagram culture. Examples are in the leaping goat branded with Gs, the skull with G eyes or the graffiti ‘tomorrow is now yesterday’; they can be disorienting in a way but mean to include contemporary narratives in Gucci’s traditional landscape expanding the target audience. The treasure hunt proposed at the beginning of the tour (spotting the iconic Sylvie bag through the exhibition) intends to highlight in a ludic way the importance of combining past and present well aware that the past needs to be re-shaped but cannot be erased without losing identity. It is a serious commitment to high quality work imagining new possibilities through innovative techniques and the power of creativity. For this reason, emblematic pieces from the archives (which count twenty-five thousand items) are displayed side by side with contemporary creations. The bamboo bag of the 60s or the web stripe (blue-red-blue or green-red-green), the stirrup and the horse bit, emblems on shoes and dresses, are present together with t-shirts, faux furs and bomber jackets. The floral rooms of ‘De Rerum Natura’ testify the decodification of the natural world defined in the exquisite realistic patterns of beetles, insects and flowers in the foulards created by Alessandra Cornero for Grace Kelly, alluding to the Garden of Eden as well as to the enchanted world of fairy-tales, which is both beautiful and fearful, natural and artificial. Valuable python skin coats from the archives are on display as well, showing the skilful use of precious material, which was often provided by the clients themselves, as it is the case of the suitcase made from elephant skin. However, Gucci will not manufacture or produce furs from January 2019 and the skins used in its products are from animals already slaughtered for the food industry, an eco-friendly program that adds an ethic angle to the company. One of the most intriguing pieces is Björk’s dress realised in collaboration with Alessandro Michele for her video The Gate (2017). 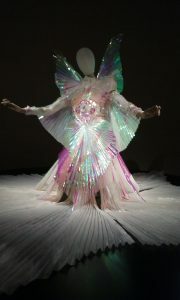 The outfit is a paramount element of the performance, an angelic creation in PVC lurex organza, crêpe de Chine and silk jersey that took five hundred and fifty hours of work and was inspired by the 11th canto of Paradiso from the Divine Comedy of Dante Alighieri, especially the section dedicated to St. Francis of Assisi. The association is not casual as Björk’s song is about overcoming the pain caused by the end of an intense relationship and the transformation of this suffering into irradiating love. It is a sublimation of love reminding of the ideas of the neo-platonic circle of Marsilio Ficino, popular during Quattrocento in Florence. The light emanating from the chest of the dress also refers to the digital world and to eroticism in a social network digital reality where human and non-human are sometimes non distinguishable. A more traditional view is expressed in Michele Obama’s dress with a map of the values of marriage printed on the fabric and in Alessandro Michele’s red blouse with ribbon, which was worn by a male model subverting the nowadays too obvious concept of gender division and proposing an androgynous multiple vision, inclusive in its exclusiveness. A video concludes this incredible experience; it has no beginning or ending and represents the labours of Hercules. Actors from Faenza perform in a gym fighting with leather dummies that have no face features, no hands, no legs and no gender connotation. It is the unending struggle of human with the rough material, which is an other but is also inside us; humans shape and re-shape it in a constant empowering re-creation. The shop has an interesting section for not-so-wealthy clients, like myself, with books, cards, matches, candles, tote bags and t-shirts at reasonable prices. They are all inspired by Gucci design as well as characters from ordinary Florentine life (Isabella Cotier’s t-shirts). Another way to translate iconic Gucci elements into a language that can reach a wider audience. Such a new vision definitely deserves a visit. L’Italia a Hollywood (Italy in Hollywood) at Salvatore Ferragamo Museum is a thematic exhibition that explores the presence of Italians in California from 1915 onwards with a particular attention to the years when Ferragamo arrived and worked at Hollywood as the shoemaker of the stars. The exhibition displays film clips and photos of the time as well as art works and explanatory captions, sometimes too long but interesting. A clear thread links Ferragamo’s fortune to other famous Italians who became successful in the US, focusing on four main figures: Rudolph Valentino, Lina Cavalieri, Tina Modotti and Enrico Caruso. Millions of Italians emigrated to the US between the end of the 19th and the beginning of 20th century. It was the most numerous ethnic group of emigrants who mostly worked in agriculture or as fishermen, miners, builders, street sweepers and barbers. Some of them became bankers or enterprisers like Ferragamo himself. The famous shoe designer came from humble origins. He was born in Bonito (Irpinia region in southern Italy) and emigrated in the US in 1916. He started making boots for Westerns and opened a Hollywood boot shop on Hollywood boulevard. His shoes were comfortable and beautifully designed, and were owned by the most famous film stars of the time, like Rudolph Valentino, Gloria Swanson and Joan Crawford. They appreciated not only the shoes’ beauty and original design, but also their good quality and perfect fit. Ferragamo eventually came back to Italy and set up his workshop in Florence employing seven hundred and fifty shoemakers. The presence of Italians in California was paramount in art, architecture and in the birth of American film. Italians were present with the Citadel Pavilion created by Marcello Piacentini at the Panama-Pacific International Exposition in San Francisco (1915), which celebrated the opening of Panama Canal and the reconstruction of the city after the 1906 earthquake. The Citadel proposed ‘a corner of Italy’ inspired by Quattrocento and Renaissance architecture with several art works on display. It was a great success. Italians won prizes, the Mediterranean style was reproduced in Californian houses and Futurist painters, like Balla and Soffici, became famous in the US. Though the character of the Italian immigrant was often stereotyped as instinctive, passional and sentimental, their creativity, inexhaustible imagination and versatility were appreciated as well. An almost natural tendency to re-create themselves was the key to success. The central room of the exhibition reproduces Ferragamo’s Hollywood boot shop according to the descriptions given by American press articles of the time, including the sofa where you can sit and take your selfie. The display shows stylish shoes worn by film stars like Valentino’s riding boots, Swanson’s calfskin pumps with bow, then sandals, Oxford, snakeskin T-strap shoes and even linen shoes. It is a remarkable display that well matches with the new collection you can find in the shop upstairs; they are artistic creations of the highest quality. The exhibition then focuses on the four main figures highlighting their personality with film clips and photographs. They all came from humble origins and made their fortune thanks to their artistic talent that combined theatrical skills, personal interpretation of their roles and creative power. Rudolph Valentino was the first Latin lover figure. He had villain roles at first because of his dark looks, then debuted as a passionate tango dancer in The Four Horsemen of the Apocalypse (1921), which made him a success. He was handsome, of course, but also very talented, unpredictable in his interpretations mixing kissing and biting, tenderness and violence, passion and sadness. Tina Modotti and Lina Cavalieri were two astonishingly beautiful actresses who worked in theatre and cinema. Cavalieri was the most famous one and was considered the most beautiful woman of her time. She was also an Opera singer who performed in Paris and in the US. Tina Modotti was more a Bohemian character in contact with Mexican militancy and artists like Frida Kahlo and Diego Rivera. The great tenor Enrico Caruso is celebrated as well, his songs accompanying visitors through the exhibition. He sang more than seven hundred times at the Metropolitan Opera House in New York and sold millions of records. His performances combined technical perfection with superb vocal interpretation, which make his concerts unforgettable. The exhibition connects with modern and contemporary times in the intriguing series of ceramic plates, Tema e Variazioni (Theme and Variations, 1952) by Piero and Barbara Fornasetti. It is a variation of portraits of woman in several plates (http://www.fornasetti.com/collection/tema-e-variazioni-category/temaevariazioni ) showing her face bottled, effaced, doubled on breasts, crowned, owl-like, on a crotch, with her tongue sticking out and with a fake nose. A though-provoking interpretation of the roles of woman in society that connects very well with the two Italian actresses, Cavalieri and Modotti, celebrated in the same room. Two contemporary Italian artists are highlighted in the exhibition involved in the project Two Young Italians in Hollywood. They are the photographer Manfredi Gioacchini, whose black and white photos perfectly capture the personality of the subject, and Yuri Ancarani, who filmed Zuma beach, west of Malibu, a famous filming site in the 60s and 90s. This site is now a pilgrimage for people to go and take selfies and videos to then upload on social network. Ancarani observes the shift in the use of this beautiful site. Italy in Hollywood is an engrossing exhibition that deftly explains and celebrates how Italians, mostly arriving in the US in poor conditions, improved and succeeded thanks to their tenacity, versatility and inexhaustible creative talents. A Review of Marnie by Jane McChrystal. Andersson Dance/Scottish Ensemble – Goldberg Variations – ternary patterns for insomnia. Review by Julia Pascal.